URBANA, Ill. — A new lightweight, low-cost agricultural robot could transform data collection and field scouting for agronomists, seed companies, and farmers. The TerraSentia crop phenotyping robot, developed by a team of scientists at the University of Illinois, will be featured at the 2018 Energy Innovation Summit Technology Showcase in National Harbor, Maryland, on March 14. Traveling autonomously between crop rows, the robot measures the traits of individual plants using a variety of sensors, including cameras, transmitting the data in real time to the operator’s phone or laptop computer. A custom app and tablet computer that come with the robot enable the operator to steer the robot using virtual reality and GPS. TerraSentia is customizable and teachable, according to the researchers, who currently are developing machine-learning algorithms to “teach” the robot to detect and identify common diseases, and to measure a growing variety of traits, such as plant and corn ear height, leaf area index, and biomass. “These robots will fundamentally change the way people are collecting and utilizing data from their fields,” said U of I agricultural and biological engineering professor Girish Chowdhary. He is leading a team of students, engineers, and postdoctoral researchers in development of the robot. At 24 pounds, TerraSentia is so lightweight that it can roll over young plants without damaging them. 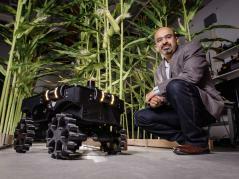 The 13-inch-wide robot is also compact and portable: An agronomist could easily toss it on a truck seat or in a car trunk to transport it to the field, Chowdhary said. Automating data collection and analytics has the potential to improve the breeding pipeline by unlocking the mysteries of why plant varieties respond in very different ways to environmental conditions, said U of I plant biology professor Carl Bernacchi, one of the scientists collaborating on the project. Data collected by the crop-scouting robot could help plant breeders identify the genetic lineages likely to produce the best quality and highest yields in specific locations, Bernacchi said. He and Stephen P. Long, a Stanley O. Ikenberry Endowed Chair and the Gutgsell Endowed University Professor of Crop Sciences and Plant Biology at Illinois, helped determine which plant characteristics were important for the robot to measure. “It will be transformative for growers to be able to measure every single plant in the field in a short period of time,” Bernacchi said. “Crop breeders may want to grow thousands of different genotypes, all slightly different from one another, and measure each plant quickly. That’s not possible right now unless you have an army of people – and that costs a lot of time and money and is a very subjective process. “A robot or swarm of robots could go into a field and do the same types of things that people are doing manually right now, but in a much more objective, faster, and less expensive way,” Bernacchi said. TerraSentia fills “a big gap in the current agricultural equipment market” between massive machinery that cultivates or sprays many acres quickly and human workers who can perform tasks requiring precision but move much more slowly, Chowdhary said. “There’s a big market for these robots not only in the U.S., where agriculture is a profitable business, but also in developing countries such as Brazil and India, where subsistence farmers struggle with extreme weather conditions such as monsoons and harsh sunlight, along with weeds and pests,” Chowdhary said. As part of a phased introduction process, several major seed companies, large U.S. universities, and overseas partners are field testing 20 of the TerraSentia robots this spring through an early adopter program. Chowdhary said the robot is expected to become available to farmers in about three years, with some models costing less than $5,000. The robot is being made available to crop scientists and commercial crop breeders for the 2018 breeding season through EarthSense Inc., a startup company that Chowdhary co-founded with Chinmay P. Soman. A former National Science Foundation postdoctoral fellow at the university, Soman is the chief executive officer of EarthSense, which is based at the U of I Research Park and comprises a growing team of engineers and computer scientists. The Energy Innovation Summit Technology Showcase, which runs March 13-15, is sponsored by the Advanced Research Projects Agency-Energy, a unit within the U.S. Department of Energy. ARPA-E’s Transportation Energy Resources from Renewable Agriculture program provided $3.1 million in funding for the TERRA-Mobile Energy-crop Phenotyping Platform robot project, which developed TerraSentia.